Greek Islands Turkey Cruise on the east Mediterranean visiting 3 Greek islands, 2 cities in Turkey and 2 cities in Greece. 8 Days full of history, culture, crystal clear waters, plenty of places and onboard entertainment combined with the fine Mediterranean and Greek food with unlimited drinks and three shore excursions included. Enjoy this cruise and promise yourself to come back and visit these places for a longer time! Embarkation starts at 14:00. Our cruise ship will leave the port of Piraeus at 16:00 for 8 full days of fun and experiences. We go along the Athens Riviera in the Saronic Gulf to the south end of Attica passing close to the Temple of Poseidon in Cape Sounion. This afternoon is a good opportunity to get around and know your ship and the services we provide. We will spend this evening in Istanbul. This gives us a good opportunity to have our first contact with this fascinating city that combines the cultures of the Byzantine empire and the Ottoman empire. The mix of East and West has resulted in some of the most impressive architectural monuments worldwide as Hagia Sophia, Blue Mosque and Topkapi Palace. Another important thing to experience in Istanbul is to be lost in the Grand Bazaar, one of the largest markets in the world of its kind, where the colours and smells of the mountains of spices, colourful clothes and silver jewellery and intoxicate our hours. Haggling is, of course, the standard through the purchase. Tonight you can enjoy the program on our cruise ship. We will spend the whole day in Istanbul and enjoy the included excursion to the Bosphorus Cruise and the Grand Bazaar. With the Bosphorus Strait dividing two continents, Europe and Asia, this is one cruise that’s truly unique. You’ll set sail by private tender boat to glide over the jet blue waters of the Bosphorus so that you can take in the city and its iconic skyline from both angles. As you weave your way between traditional fishing boats and ferries, you’ll soon see the Orient and Occident emerging. Keep a lookout for the glamorous 19th century Dolmabahçe Palace and the former Ottoman palace of Çırağan, now a luxury hotel, on the European riverbank. On the Asian side, the summer residence of the sultans, Beylerbeyi Palace, as well as the Anatolian Castle medieval fortress and magnificent Kanlica Villa all soon come into view. Then, back on dry land, you can stretch your legs with a stroll around the labyrinthine Grand Bazaar. Try haggling for souvenirs, or simply browse the myriad of goods on offer. Canakkale is a city in northwestern Turkey in the Marmara region, on the Dardanelles Strait. It’s a gateway to the Gallipoli world war 1 battlefields, north of the narrow strait. On the grounds of the 15th-century Çimenlik Castle, Çanakkale Naval Museum Command contains historical artillery. The city is the nearest major town to the site of ancient Troy. The “wooden horse” from the 2004 movie Troy is exhibited on the seafront. The archaeological site at Troy, including an ancient theatre, is southwest of the city. We arrive at Volos in the morning and will stay here the whole day. Volos is a coastal port city in Thessaly situated midway on the Greek mainland. Volos is the newest of the Greek port cities, with a large proportion of modern buildings. Volos is well known for its assortment of mezedes and a clear, alcoholic beverage known as tsipouro served in many small or large restaurants. Participating in the optional tour you can visit the Monasteries of Meteora. Meteora is one of the largest and most important complexes of Eastern Orthodox monasteries in Greece, second only to Mount Athos. Among striking scenery, perched on top of huge rocks which seem to be suspended in mid-air, stand ageless Monasteries, where you can see exquisite specimens of Byzantine art. The six monasteries are built on natural sandstone rock pillars, at the northwestern edge of the Plain of Thessaly near the Pineios river and the Pindus Mountains, in central Greece. The Meteora is included on the UNESCO World Heritage List. Early in the afternoon we arrive at Heraklion and have the chance to explore this beautiful city, the capital of Crete, the largest of the Greek islands. Archaeological treasures, magnificent ruins and museums, glorious beaches and fabulous restaurants make Crete a complete vacation spot. Participating in the included tour and visit the ruins of Knossos, one of the most famous archaeological sites in the whole Aegean, provides a fascinating insight into the sophisticated Minoan civilization. See the Throne Room, the fresco of the Prince of the Lilies, the imposing Grand Staircase and the Queen’s Megaron. The tour also includes stop inHeraklion for a short walk through the historic center before returning to the vessel. In the morning we reach Santorini, one of the jewels of small volcanic archipelagos five islands is undoubtedly Santorini. Santorini was created due to a volcanic eruption culminated in the explosion of a volcano caldera, therefore, its rugged landscapes dotted with huge cliffs. Santorini’s capital, Fira, with white-washed houses, narrow streets and open air cafes that cling to a steep cliff, is at the top of the beautiful island where you can enjoy the beautiful views of the bay. 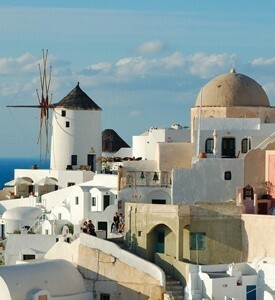 Santorini villages retain their authenticity, with beautiful blue and white buildings and barren volcanic rocks. It is a very fascinating and picturesque island. A magical place that has nothing to do with the rest of the Greek islands, a place to spread the peaceful and hospitable nature of its people. With the included tour we head up the black, volcanic cliff face of Santorini and drive to Oia, perched on the very edge of the caldera. This beautiful little town has stylish shops and restaurants and arguably the best views of Santorini, not least the island’s famous whitewashed churches with their sky-blue domes, the Aegean glittering far below. Late in the afternoon, we arrive at the world famous Mykonos. MONDAY: PIRAEUS (ATHENS): In the morning we arrive in Piraeus port. After breakfast disembarkation and continue for your Greece vacation or for your return home trip. In the cruise price are Included: All meals on board, Service charge, All drinks and 3 shore excursions.